T&E mechanism so that the eyes are even with the top of the elevating handwheel. 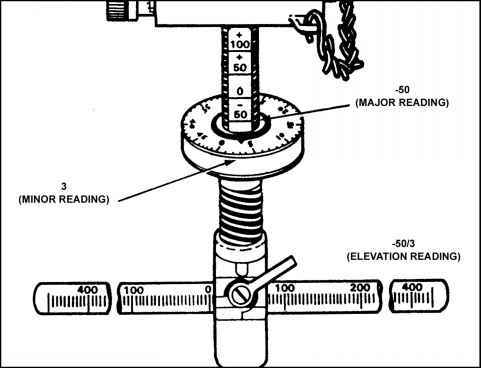 The major reading (for example, -50) is the first number, with an index line, that is visible above the handwheel (Figure 4-7). (2) Minor Reading. The elevating handwheel is marked in 50 increments of 1 mil each (Figure 4-7). The minor reading, which has no plus or minus sign, is the number that lines up with the pointer. The minor reading represents the number of mils the gun is laid below the major reading, for example, 3 mils. Verify a direction elevation reading by firing and adjusting on the target. Use the dry-fire method to get data to targets without live firing and adjusting. Set the rear sight on the range to the target, lay the gun on the center base of the target, and take direction and elevation readings. Use the dry-fire method only when firing is not feasible. The exercises include sighting and aiming; sight setting and laying; manipulating; determining the range; and preparing a range card. a. Sighting and Aiming Exercises. There are two sighting and aiming exercises. The first calls for the use of the sighting bar. (1) This exercise teaches how to obtain the correct sight picture, and also teaches alignment methods. Sight alignment means lining up the front and rear sights, with the top center of the front sight blade appearing in the center of the rear sight. Sight picture means lining up the front sight, the rear sight, and the target, with the tip of the front sight blade just touching the bottom center of the target. 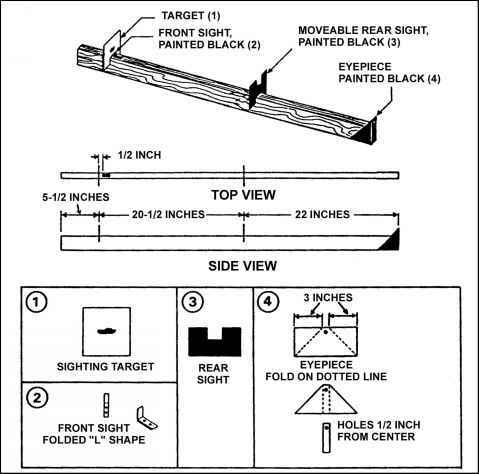 Gunners must show skill in aligning sights correctly and in getting the correct sight picture, using a sighting bar (Figure 4-8). Gunners must correctly show the point of aim, after sight alignment, 8 out of 10 times. (2) The second sighting and aiming exercise, used with the MK 19 and target board, allows the gunner to apply lessons learned during the first exercise. Place the target board 10 meters from the muzzle of the MK 19 (Figure 4-9). 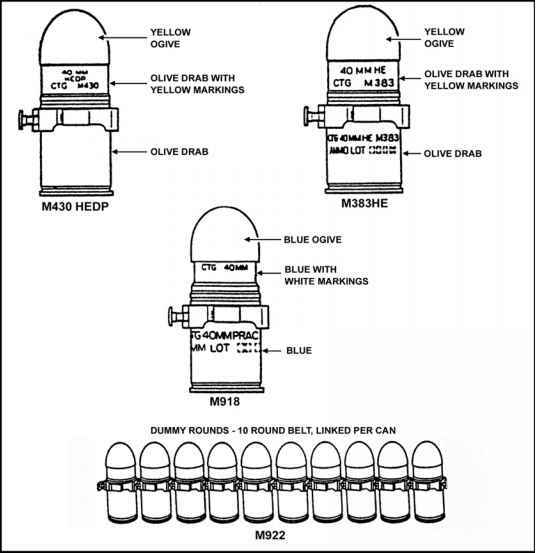 Use the T&E mechanism to get the correct sight picture on each target that is called out. When the gunner feels he can sight and aim, the coach checks and critiques the gunner's ability to change from the start point on the target board to any new target called by the coach.